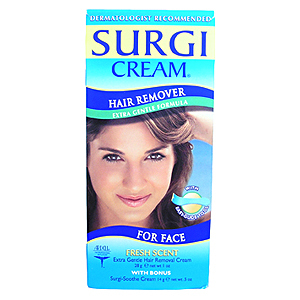 Improved Surgi Cream Extra Gentle Hair Remover for Face, Specifically formulated for those with sensitive skin. Surgi-Cream Extra Gentle for Face is a quick, effective and gentle way to remove facial hair from upper lip, cheeks and chin. Smooth on Cream Hair Remover, relax for a few minutes and rinse away. Product works in as little as 4 minutes. Extra gentle formula now features Maple Honey, known for helping skin retain moisture. With Surgi-Cream, the hair removal process is even more kind and gentle on the delicate skin of your face. As a bonus to you, we have included a Free tube of Surgi-Soothe Cream with Hair Stop Plus™. Hair stop Plus™ contains extracts of papaya, citrus and olive to naturally minimize the appearance of new hair growth. Pro-Vitamin B and Aloe Vera calm, soothe and moisturize. (1) Surgi-Soothe Cream 14g (.5 oz). Hair Removal Cream: Water (Aqua), Calcium Hydroxide, Cetyl Alcohol, Ceteth-20, Hydrogenated Starch Hydrolysate, Sodium Silicate, Thioglycolic Acid, Bisabolol, Acer Saccharinum (Sugar Maple) Extract, Aloe Barbadensis Leaf Juice, Cucumis Sativus (Cucumber) Fruit Extract, Honey Extract, Sodium Lauryl Sulfate, Fragrance (Parfum).